It wasn’t far from the Inner Harbour but my memory for numbers is the pits; at the exact moment I reached for my iPhone to check Google Maps, a city bus drove by. 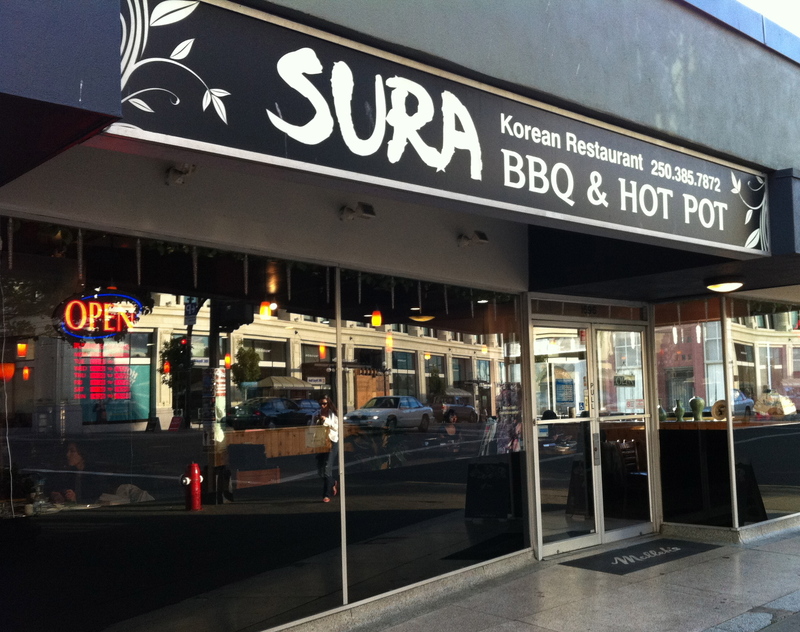 Lo and behold, on the side of that bus there was an oversized advertisement for the Sura Korean Restaurant – my destination – complete with address. Within a few moments, I was looking at the door feeling a slight trepidation about going in. I took the plunge and entered the restaurant alone off of Douglas Street. I had been told there were only three Korean restaurants in Victoria. This one had had the best online reviews. RaVen was waiting at the door to greet customers as they came in. He had a slight build, a black pressed shirt and nicely fitting gray trousers. His appearance was sleek: short black hair, slightly longer and directed upwards from his forehead, and tall. I admit it. There are many Canadians who have never tried Korean food. I am one of them. I would be completely reliant on my own common sense guesswork in this restaurant, or, I would have to ask my server. The first option was not a plausible one; I launched in with my server. It was RaVen. RaVen turned out to be the manager; with almost four years of hard work and a minimum of 50 working hours a week, he had accomplished this position. And it was obvious why. His experience, which included owning his own western-style restaurant in Seoul – called Oxford – pierced through his polite, helpful manner. Within five minutes of expertly leading me through the menu and answering all of my questions, I had made my choice. Dolsot Bibimpop. Not only did it sound delicious, but pronouncing this dual vocabulary combination was fun! Wistfully looking around, I noticed those at the special Korean Barbeque tables were busy cooking and enjoying their shared meal. RaVen had explained that Korea is known for its culture of sharing things like food. It was unusual for customers to eat Korean Barbeque alone. Small flavourful dishes of bean sprouts, marinated potatoes, fresh spinach leaves and spicy kim chi are normally placed on the table amongst all of the guests for everyone to sample; these I would receive and eat alone. Sharing in Korean culture dates back through history. On farms for example, Korean neighbours will often pool their labour and help each other complete various projects on the land, making the job easier and faster for each. RaVen pointed out this concept, which must have been a very important one prior to the heavy urbanization of South Korea, which sits at just over 83% of the nation’s citizens living in cities – higher than in Canada! It is Canadian culture and norms which RaVen had learned more about over the last few years; he had needed to learn a lot and learn it fast in the restaurant business. Canadians are more direct, he said. So many people in Canada have allergies, he noted. In Korea, allergies were hardly known. Korea, he really missed. 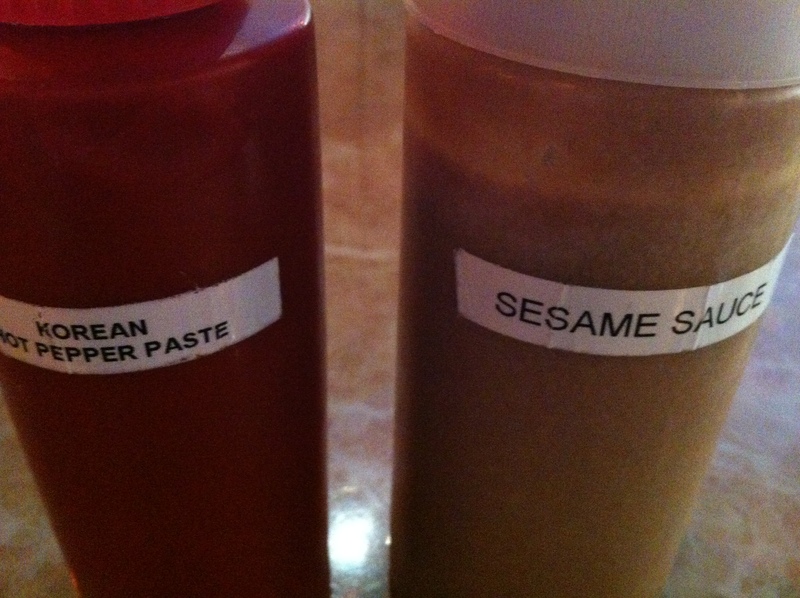 My Korean dish had arrived, so I set about trying sauces and setting the right spice level by squeezing the Korean Hot Pepper Paste alternately with the Sesame Sauce. A lot of spice is not traditionally Canadian, and I was worried that I had met my spice match. However, the egg, mushrooms, rice and vegetables which combined in my hot stone pot made an explosively tasty dinner. 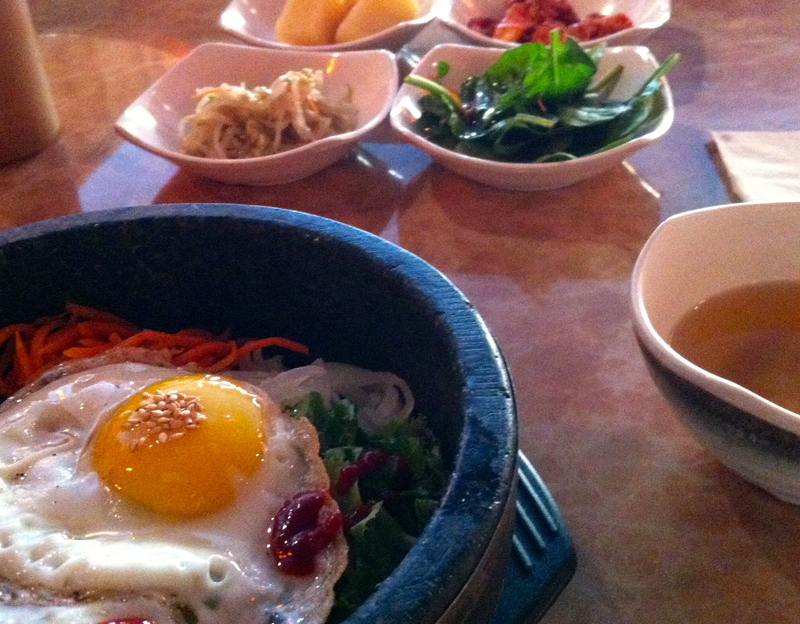 My foray into a world of Korean food and people was intriguing and compelling. Not only that, I had been hungry so aside from having to ask a few questions, dinner was an exciting, new and delicious experience! It had not been easy for RaVen, at 23 years old, to venture into Canada, learn English and fit in. Two hours in the Sura Korean Restaurant and the uncertainty I felt for a few minutes in ordering and eating was insignificant considering the four year space in time which this young gentleman shared with all of his customers, far from his family, culture and familiarity. If you are reading this, already having tried Dolsot Bibimpop, forgive me for waiting for so long to have it myself! And thanks RaVen!